Are dragons real? Don't be in a rush to say, "No." Not if you didn't visit the Maritime Aquarium at Norwalk in Connecticut while the attraction added dragons to its line-up of creatures on display in 2015. The dragons are no longer on exhibit, but this archived article will show you these fascinating creatures. There are nine species of real dragons in the exhibit, "Dragons! Real or Myth?" and one is so rare, there is no other place in the U.S. where you can see it. "Would you like to go to the aquarium to see a baby black dragon?" I asked my 12-year-old daughter. Of course, her enthusiastic response was: "Of course!" Like most kids her age, she is fascinated with dragons. These winged, fire-breathing lizards are making increasingly frequent appearances not only in books and movies, like the Harry Potter epic, aimed at tweens and teens, but in decidedly grown-up entertainment like HBO's Game of Thrones series. Still, I was startled to learn dragons are making an appearance in... Connecticut! And especially intrigued that the Maritime Aquarium is home to one of only 31 black dragons in America--and the only one on public view. So, we headed south to see this rare, solid-black lizard for ourselves. My first reaction when we spotted the black dragon, which is actually an extremely rare melanistic form of the Asian water monitor lizard (Varanus salvator macromaculatus), was: "That's no baby!" But signage explained he'll grow to be a mighty lizard: as big as six feet long and 60 pounds. The only larger lizard is the Komodo dragon. Melanism, we learned, is the opposite of albinism: It is an overabundance of pigment, as opposed to the lack of pigment seen in albinos. Water monitor lizards are normally gray with yellow spots and black stripes. 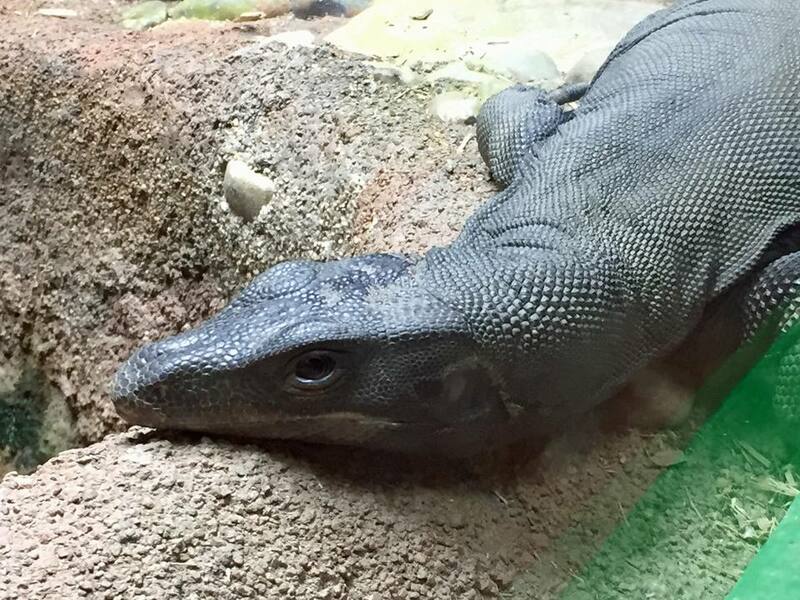 The Maritime Aquarium's resident blue-tongued black dragon wasn't spewing any flames or squashing any foes or soaring over any castle walls. The most exciting thing he was doing was... molting. Still, it was cool to ponder how the dragons of lore--maybe even Toothless in How to Train Your Dragon--may have been inspired by an unusual lizard like this. All of the other black dragons in the country are in private hands, so dragon fans will want to seize this chance to observe one of nature's unique creations. Plus, there are more dragons to see! Weedy Sea Dragons certainly sound like imaginary cartoon creatures (or a rock band). But our favorite real dragons at Connecticut's Maritime Aquarium are actually fragile Australian fish (Phyllopteryx taeniolatus) that are perfectly camouflaged for their habitat: coral reefs and seaweed beds. Like their closest relatives--seahorses--males of this fun-to-watch species carry eggs and "birth" babies. There are mentions of sea dragons on ancient maps and even in the Old Testament of the Bible, but these little guys are more threatened than threatening. The species is currently classified as Near Threatened by the International Union for Conservation of Nature. It's not every day you get close enough to see the sharp fangs inside the mouth of a Dragon Moray Eel (Enchelycore pardalis). I was glad there was glass between me and this fella. Dragon Moray Eels can grow up to three feet in length and will eat pretty much anything they can get their mouths around. They're as scary-looking and fantastical as any dragon invented by the human mind. By comparison, the Australian Water Dragon (Intellagama lesueurii) is almost cute! And word is, these guys are a bit cowardly. They'll scurry into the water at the slightest disturbance and can stay submerged for over an hour. Friendly dragons inhabit both folklore and modern fiction: They have wise and gentle eyes like this real-life dragon. This furry-faced dragon hails from Australia, too. The Bearded Dragon (Pogona vitticeps) is a desert dweller that puffs up its spiky chin and neck scales when it gets angry. If you've ever dreamed of having a pet dragon, this just might be the breed for you. Check this out. Indonesia's Sailfin Dragon (Hydrosaurus amboinensis), which can grow close to 4 feet long, leaps from high branches into the water, using its sail-shaped tail for stability. Lizards are not directly descended from dinosaurs, so perhaps their prehistoric ancestors were giant reptiles who flew a bit and breathed fire. It's fun to imagine. The Maritime Aquarium's "Dragons! Real or Myth?" exhibit really delves into the similarities between real, living dragons and the mythical beasts we know from books, movies and TV. The Frilled Dragon (Chlamydosaurus kingii) unfurls its neck frill to make itself look larger and more ferocious. Exhibit signage reads like a fictional story: "Females lay 8 to 23 tiny eggs in an underground nest, and hatchlings emerge fully independent and capable of hunting and utilizing their frill." Doesn't that sound like something J.K. Rowling would invent? And Mountain Horned Dragons (Acanthosaura capra)... believe it or not... change color based on their moods! The vivid green Chinese Water Dragon (Physignathus cocincinus) has fictitious-sounding traits, too. For example, it communicates with other water dragons by waving its arms and bobbing its head. In China, dragons have symbolized strength, power and good fortune since ancient times: They are an integral part of Chinese culture. I hope you'll have the good fortune to see these nine real dragons on a visit to the Maritime Aquarium, where you can also experience Long Island Sound's marine life in unique ways including jiggling jellies with your fingertips and petting stingrays. If you're going... The Maritime Aquarium is located at 10 North Water Street in Norwalk, Connecticut. It's a one-hour train trip from New York City's Grand Central Station. Take Metro-North to the South Norwalk train station, and follow these walking directions. What is B.B. King's Real Name?